You may have noticed, but I’m a pretty sentimental person. Which is why when 2017 rolled around, I realized that I had to do something special this year for C2E2; this year is the fifth year that my friends and I will attend the Chicago-based convention, and I can’t believe how much time has flown. The fact that I’m making my first fully-fabricated cosplay for this year wasn’t really a coincidence, but rather a celebration of what I’ve come to learn from the cosplay community, my friends, and what I draw back on from my own knowledge. I wanted to make this year special, and celebrate the convention the way my friends and I have always wanted to: by attending all three days of the convention. We also wanted to expand our show floor breadth and try new things, meet more people, and become more social. 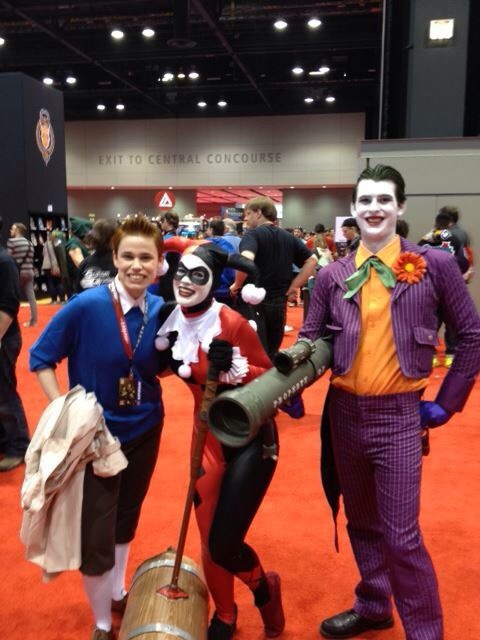 Because I’ve met so many amazing people, dressed up as my favorite characters, and done a ton of cool things, I wanted to reflect on my time at my favorite convention in a special lookback post for C2E2 Week. From cosplays to my favorite moments, I’ll look back at these last five years in the spirit of convention season, and to get pumped for this upcoming weekend. So grab a snack, and let’s go back to my very first year! I was a freshman in college, and I had just discovered The Adventures of Tintin. Needless to say, I became obsessed (my friends can attest to this), and Tintin became a very god character for me. So much so that after dressing up as the Belgian reporter, I decided to reprise the costume and go to C2E2 in full garb. Surprisingly, lots of people recognized me, including an incredibly nice woman who was French and grew up reading the comics. She was so sweet. I also got the chance to meet some amazing artists and fellow nerds while there, and afterwards my friends and I roamed a local Wal-Mart in cosplay because we were so pumped from the day. 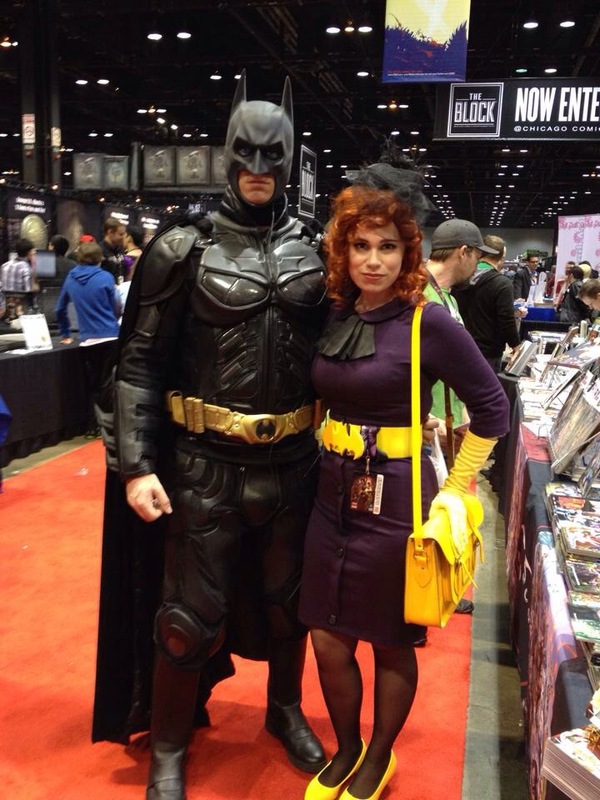 This C2E2 ignited our love of conventions, and we went to Wizard World that later that year. But C2E2 has always held a special place in our hearts. In 2013, my friends and I were thrilled to go for a second year to C2E2, so we planned our cosplays carefully. 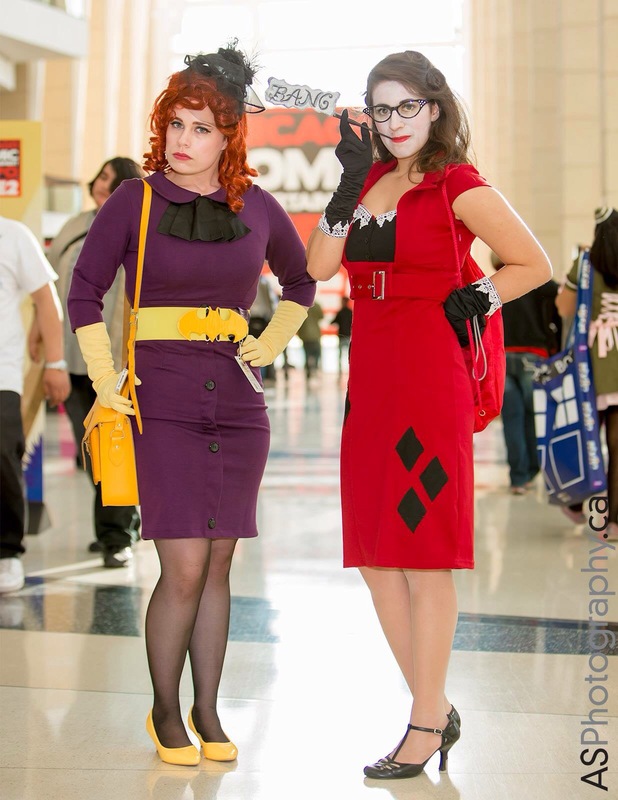 One of my friends and I decided to go as pin-up Batgirl and Harley Quinn (before the DC Bombshells became popular). I obviously went as Batgirl, and my friend went as Harley Quinn. Granted, I didn’t fabricate the best fascinator, and I’m still perplexed over that weird scowl, but this cosplay sparked my love for creating costume pieces. I made that waist belt, altered the headband to look like a 1940s style fascinator, and dyed vintage gloves to match the rest of my ensemble. Not many people realized who I was at first, but I think some people got a kick out of my cosplay (the Batman in the previous picture thought my cosplay was cool). This was also the year that we started meeting more celebrities. We met Natalia Tena (Harry Potter, Game of Thrones), Veronica Taylor (original voice of Ash in Pokémon), and Ernie Hudson (Ghostbusters, The Crow, Miss Congeniality). 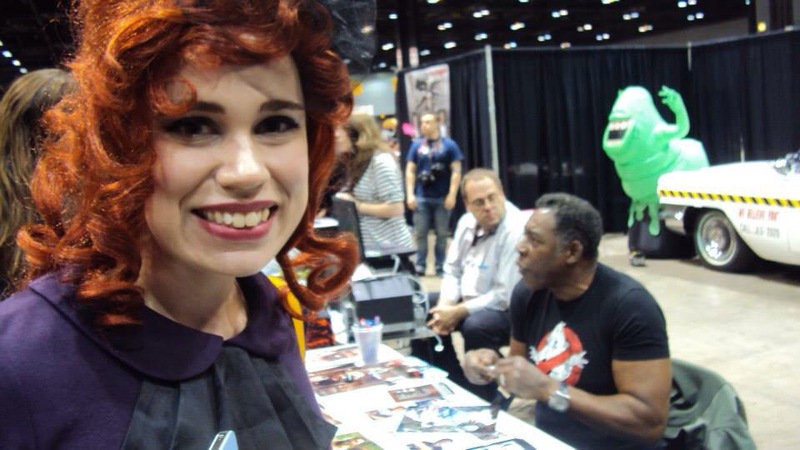 Meeting Ernie Hudson was definitely the highlight of C2E2 2013, and I still talk about the encounter to this day. When I walked up to meet him, I spent probably a minute shaking his hand and praising him for basically being a part of my childhood. After I said my peace, he stood up, walked around the table, and gave me a hug! It was such an unforgettable moment, and makes me wish everyone could have an experience like that. The year this blog was created, I decided to chronicle my journey of creating a female Two-Face cosplay as cheaply as possible. Detailed in my “$50 Cosplay Challenge” series, I did my best to come up with an inexpensive cosplay, and put my crafting knowledge to the test. I even made a YouTube video on how to apply Two-Face makeup with just eyeshadow and water! Needless to say, this project was a labor of love. The white shirt I wore had hand-painted leopard spots on the “gross” side, I bleached half of my thrift store suit in my dorm room (sorry, friends), and I painted one shoe black after a disastrous dyeing attempt. But the results were better than I could have ever expected. 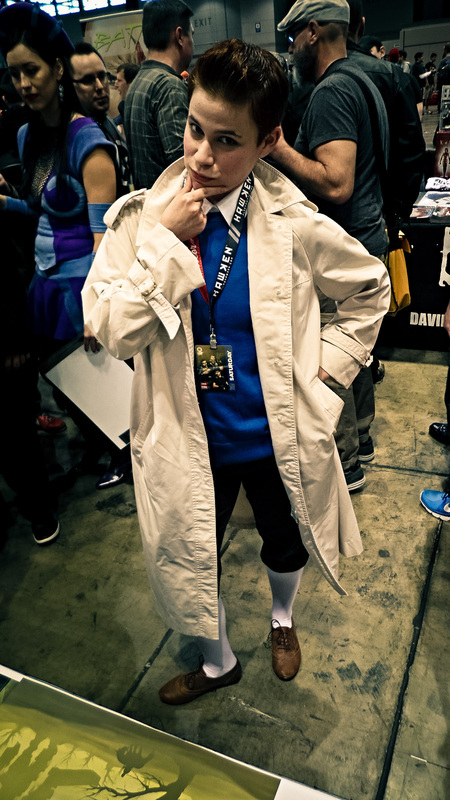 I still look back at this cosplay fondly from time to time, and it’s perhaps one of my favorites I’ve done. Data’s makeup was much more intricate than I had anticipated, and I ran into so many snafus that I was ready to call it quits. Luckily, though, I found a good application method, and went to C2E2 as my favorite Star Trek: TNG character. This was, by far, my favorite convention year. The whole day was filled with tons of fun, and I got to pick up amazing items and meet great people. My friends also dressed up as beloved characters (Rey from Star Wars and Missandei from GoT), and we walked til our feet were sore. I even encountered fellow Trekkies! If I were any good at blogging on time–or if I weren’t so busy–I’d have a Part 2 for my “Becoming Batgirl” series like I had intended. But, such is life. You can check out a recap of my cosplay antics over on my Instagram, and I’ll have a more detailed Part 2 up within the coming weeks. As for this year, I’m hoping to explore more of what the convention has to offer. I know there will be amazing people there, great shopping, and cool cosplays, but for three days straight? Oh hell yeah, I’m thrilled! C2E2, as I’ve said it dozens of times, is my absolute favorite convention. There’s a reason why my friends and I keep going year after year, and I can’t wait for this weekend and future C2E2s. But, most importantly, I can’t wait to make even more memories. Are you going to C2E2? What’s your favorite cosplay you’ve ever dressed up in? Let me know in the comments so we can nerd out! Love this post! C2E2 is on my list of conventions to go to! I’m from the Minneapolis area, so it’s still local but pretty big at the same time! One day you’ll have to make the trek! Hopefully so!! Too bad I’m not Tintin this year, or we could have been detectives together! OH MY GOSH!! Your cosplays are so wonderful! That Two-Face is amazing, and I still love your Data so much. I can’t wait to see pics of Batgirl this year!! Your cosplays are so amazing! Congrats on your five years! Are you watching Cosplay Melee on Syfy? It’s a pretty great cosplay show and I get so much inspiration from there. I’m not experienced at all but my favorite Cosplay was Matt the Radar Technician/Kylo Ren from SNL. Hope you have a great time with your friends this year! Thank you!! I’ll have to check that show out! I wasn’t experienced until I just started trying different things, so never be afraid to try!